I made no bones about it. This was not exactly how I wanted to kick off 2013, but with a 5-year-old and a wife who eagerly wanted our son to experience Mickey, Donald, Goofy, and the castle, onward we pressed. My biggest concern about the trip was one glaring question around mobility. With cerebral palsy, I walk with forearm crutches and can get around just fine for the things I do in my daily life. But at four theme parks that cover a total of 47 square miles—or the size of San Francisco—I didn’t like the thought of the most intense shoulder workout ever as we trudged around such a magical kingdom. I also didn’t want to jump into a wheelchair and be pushed around by my wife or my mother, who also went with us. Not because of the ego thing. It’s just that I know it would not have made for an enjoyable time for either of them. Fortunately, Disney had a good alternative: the electric convenience vehicle, or ECV. ECVs are common. You know, the scooter-like, four-wheel vehicle with a basket in front (remember those commercials with one sitting on the edge of the Grand Canyon?). Some are stylish red with a sleek design. Others, like Disney’s, are primer gray with some bumps and bruises. Still, the option was essential. The ECV may be common knowledge among Disney lovers, but as a first-time guest I was in mobility heaven. 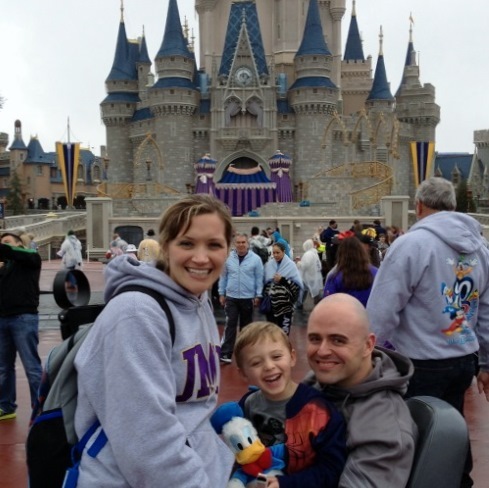 Disney World was, in fact, the most accessible vacation I have taken. Parking was easy. 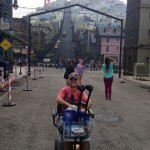 We drove from our on-site lodging and used the accessible parking at each theme park (although Hollywood Studios calling accessible parking “medical parking” was a bit of a joke). The ECV made getting around the parks quite simple, and offered some storage from our daily junk, er … purchases. 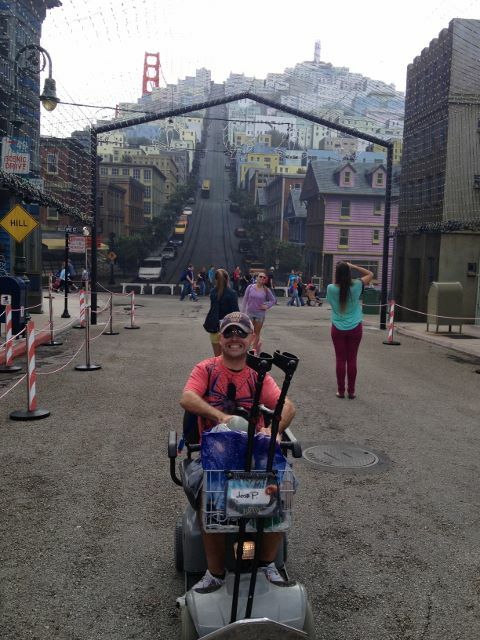 Additionally, our second day at Disney World was in Hollywood Studios, where we met another family in line for the Toy Story ride that told us about the Special Assistance pass for rides I could obtain from guest relations. So I marched into guest relations, asked about the Special Assistance pass, and was handed a stamped note card. Many of the rides in each park have an accessible entrance, and you must have the Special Assistance pass to use this entrance. You just tell the first cast member you see in line, and get shuffled over to the exit of the ride. There, you can transfer from a chair or ECV and get on the ride before anyone else in line. The Special Assistance pass isn’t a line bypass, but it comes in handy for avoiding any wait time from the regular line or the Fast Pass lane. You might wait 5-10 minutes for the ride to stop and people to exit. I didn’t see the Special Assistance pass advertised and none of my friends knew about the pass. None of the cast members informed us of such a pass, so it appears as though it is an ask-only perk, which makes sense to avoid total congestion of everyone using the Special Assistance entrance to many rides. Finally, the simple knowledge from the Disney cast members with regard to disability made an impression upon me. There was a quiet, workmanlike approach to assisting that was shown by the cast members. They didn’t ask what they could do or how they could help; they simply did it. They didn’t appear as if any request was out of line, inappropriate, or bothersome; they simply responded. The final impression of the cast members’ knowledge is nothing that should be overlooked. Knowledge is where action begins, and Disney’s cast members were well versed in how to assist guests with disabilities. Am I ready to go back? My wife has already asked that question, and just today our son was singing a Disney tune as we walked into a restaurant. I might not be ready to return to such a magical destination that is full of both kids’ smiles and tears. But I know Disney sets the standard on how to accommodate guests with accessibility concerns. That, alone, may bring me back sooner rather than later. would like to thank you for sharing this post as it has really helped.